Cabela's Signature Model Mandolin headstock and logo inlaid with select Alaskan gold dust. Sidney, Neb - Thomas L. "Tommy" Millner, Chief Executive Officer of Cabela's, the World's Foremost Outfitter® of hunting, fishing and outdoor gear has announced the acquisition of New Millennium Acoustic Design Carbon Fiber Mandolins of Waterville, Vermont. The announcement was made on March 31, 5:00 p.m. CDT at the company's headquarters in Sidney. "Carbon fiber products are an important part of the future of the outdoor entertainment product line Cabela's is known for," said Millner. "In our continuing position as the world leader in the outdoor sports market, the Board of Directors felt that this superb small niche music company in the heart of the beautiful Vermont mountains was a natural fit with Cabela's corporate philosophy of providing exceptional products to our customer base, and many of those customers are musicians as well as passionate outdoorsmen. "Over the years, we've seen more products move from wood to carbon fiber as evidenced by our line of kayaks, canoes and boating stock. New Millennium's existing use of carbon fiber is a familiar technology for our suppliers and an instant match for the direction we're headed. This will further extend our capability to pool resources and pass on those savings to consumers while providing an exceptional product the pleases the customer. "Carbon fiber products are also a natural extension for today's outdoorsman, seeking the comforts normally found at home to go with the outdoors experience. A carbon fiber mandolin will easily withstand the brutal cold of a winter ice fishing outing or a 100+ degree hike into the Grand Canyon with back pack and fishing gear without the worry of damage to the instrument. Plus, it looks great next to a plate of fried trout." New models designed by Cabela's marketing team with the company's customer base in mind have already been approved and include a redesigned headstock for the Signature Model Mandolin (displayed above) with Cabela's logo tastefully inlaid with select Alaskan gold dust. With the true stealth outdoorsman in mind, the Vermont Fall Foliage model provides important camouflage capabilities while serving as a tip of the hat to the innovative creators from New Millennium. In the acquisition, previous owner and creator Peter Mix has agreed to a 3-year term as Manager of Emerging Carbon Fiber Technologies with Cabela's. With an August 1, 2010 launch in mind for availability, the company has prepared a special packaged Fall hunting or fishing deluxe starter music kit (retail, $5,000 + local taxes) that will include the Vermont Fall Foliage F model, a copy of Ben Winship's Fishing Music CD, Cabela's signature Super Tat'r™ II Turkey Vest, and an autographed 8 x 10 framed glossy photo of Sarah Palin, former governor of Alaska, avid hunting and fishing enthusiast and company spokeswoman. Cabela's Incorporated, headquartered in Sidney, Nebraska, is a leading specialty retailer, and the world's largest direct marketer, of hunting, fishing, camping and related outdoor merchandise. Since the Company's founding in 1961, Cabela's® has grown to become one of the most well-known outdoor recreation brands in the world, and has long been recognized as the World's Foremost Outfitter®. Through Cabela's growing number of retail stores and its well-established direct business, it offers a wide and distinctive selection of high-quality outdoor products at competitive prices while providing superior customer service. Cabela's also issues the Cabela's CLUB® Visa credit card, which serves as its primary customer loyalty rewards program. Cabela's stock is traded on the New York Stock Exchange under the symbol "CAB." New Millennium Acoustic Design Mandolins, aka New-MAD, brings decades of devotion to mandolin-family instruments and their construction coupled with state-of-the-art carbon fiber fabrication processes. The aim is to wrap carbon fiber, an extraordinary material that is unaffected by temperature and humidity and has tonal characteristics similar to fine tonewoods, around proven sound chambers for today's modern musician. Sorry, I feel that it kinda cheapens a really cool mandolin, I don't think I'll will rush to get one with Cabela's on the headstock. Yeah!! ya gotta love a mandolin in full Camo. just the thing to be playing wilst you wait for that big buck! So this is it for this special today. Nice story! As an hindsight, power to people like Peter Mix, Pete Langdell, Will Kimble etc. I still dream about the Monroe movie. I would love to see Danny DeVito as Chubby Wise. I did a TOPEKA search and this is the real deal! Not! I knew they could be used to paddle a canoe! You had me. Beautifully-written corporate-talk. Nicely done. Asleep at the wheel as usual on the 1st. Got me too. The Sarah Palin 8x10 was a nice touch. Hilarious. Man, I was the first one to get gotten! I didn't even think what day it was. I'm looking forward to the Blaze Orange "Pumpkin Top" model due this fall with a deer antler nut and bridge saddle. If this were true, who would buy a camo mandolin? If you take it camping and set it down, it'd take you forever to find it! Almost got me hook, line & sinker!!!! I have to admit it was good. Wow - I hadn't finished my first cup of coffee...so you had me for a second! Good one! I love it - an autographed picture of Sarah Palin in every case. Yeah! hook, line and sinker. I took it. I usually don't though. Musta stayed up too late last night playing mandolin. Full camo and logo inlaid with select Alaskan gold dust. I gotta get me one of these.. The dig at Sarah Palin was unnecessary and not in keeping with the Cafe's "no politics" policy. I was shut down once for mentioning Mitt Romney in a non-political context....just for typing his name in a forum post. "Plus, it looks great next to a plate of fried trout." I didn't quite see a "dig" at Sarah. It was the one thing that tipped me off to the ruse. That and the Alaskan Select Gold Dust inlay. I wouldn't mind the camo mando but you can keep the Sarah Palin pic. Inhale deeply - does this whole posting reek of APRIL FOOLS!!!!!!!!!! My wife and I were just talking about a camping trip last night, and about whether I should take a mando or not. I sent a link to her email at work. The response ten minutes later ... "I suppose you want one." (Impatient tone of voice implied). I have one on order that has a collapsable fishing rod in it. The tuners convert to a reel and it is strung with one continuous string that can be removed and used for the line. I guess I'll have to buy my own hooks. Yes, if you remove the truss rod cover and extended an 8' section of bamboo ya could do some serious fly-casting with an A model w/o missing a note. I was suspicious with the Alaskan gold dust, the Palin photo package, and Peter's appointment to Cabela's staff, but, damn, I wanted the camo mando!!! I'm a big fan of Cabela's, and got pretty excited - until I remembered today is more than my son-in-law's birthday. Thought I could get a camo mandolin to go along with a camo guitar from Martin. Vermont Fall Foliage?? that ain't no part of nothin' it's gotta be Mossy Oak !!! or is that only on the F models? April Fools... Oh! Geez... I found myself wondering it Bass Pro Shops would be picking up the Composite Acoustics line of Carbon Fiber guitars. I own a company that builds CF kayaks and canoes so am very familiar with the material and processes. I can't imagine why anyone would buy a CF mandolin. It would sound like #### and probably have terrible balance. With junk like this being peddled, I feel confident that my custom built mandolins will be even more appreciated by those who love to play and appreciate the beauty of the instruments. Lefty Luthier wrote: "I own a company that builds CF kayaks and canoes so am very familiar with the material and processes. I can't imagine why anyone would buy a CF mandolin. It would sound like #### and probably have terrible balance. With junk like this being peddled, I feel confident that my custom built mandolins will be even more appreciated by those who love to play and appreciate the beauty of the instruments." You need to get out more Lefty, truthfully the Peter Mix mandolins sound damn good. You'll have to paste this link in your browser as BB code doesn't work in this section. There are sound clips on the site. They're excellent high end instruments. Any of you die hard hunters who really want a mossy oak or camo Mix could likely get it. Peter made one with cool red maple leaves that, if I'm not mistaken, Eddie Sheehy has or had. No need for autographed posters or gold dust inlay. I would be happy to own the Kimble Mix collaboration. I watched an episode of American Chopper that showed camo patterns being applied to bike parts via a liquid bath and was amazed. I would love to have a mando in Mossy Oak. When I come in from the woods during hunting season, I can grab my mando and just let it disappear in my lap while picking out a few tunes. But seriously, a mando in Army ACU or Air Force ABU camo would be an awesome tribute to our servicemembers. I want one. I knew it was a hoax right off in fact I came looking for this year's A/F joke. I still want one. 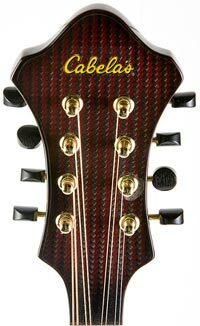 Is that woven fabric on the the "carbon fiber" background on the "cabelas" headstock? Doesn't look like carbon to me, more like a picture of a shirt or something. Yes the carbon fiber is actually a "cloth" and epoxy mix. Oh....hahahaha! April Fools!!! I was like WHAT? at first and then I thought, well maybe, then I said, nahhh! Good one! I have been interested in them since I heard my first and only one. Perry (McMule - can't remember his last name) play one at the Monroe style camp two years ago. I am thinking my next mandolin will probably be one of those or a Kimble. Here is a quick job. I knew it was A/F but the idea is really good... the Cabellas catalog has huge distribution and Cabellas customers are well willing to splash out for high-quality gear (whether their outdoors skills can justify it or not), so I would think that New-MAD would reach a huge new customer base. Mix would have extra capital to ramp up production and try new ideas. As for the camo, I find the Martin guitars with camo or Felix the cat etc. not my style but they must be selling or else Martin won't make them. Although I knew it was A/F and the piece was made up, it reads completely straight until we get to the Alaska gold dust and ex-Gov. Palin... that was fun reading and a good give-away it's a joke. Cabellas, if you read this, think about that acquisition!